The South Farmingdale Water District recently installed state-of-the-art water meters throughout the District . By having these new meters installed, consumers can monitor their own usage and save money on their water bills. All you have to do is set up a user profile through EyeOnWater® on your phone, mobile device or desktop. 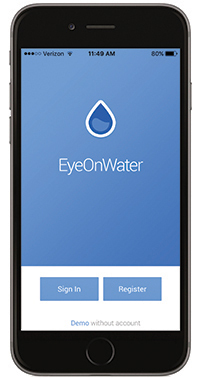 Consumers also have the option of downloading the EyeOnWater® App through the Apple App Store or they can get it on Google Play. Once you set up your user profile, you can monitor your water usage hourly, daily, weekly, monthly or yearly on your phone, mobile device or desktop. This will help you keep an eye out for leaks, which can save you money. Please note once you leave this page and go to the EyeOnWater® web page, you are no longer on the South Farmingdale Water District website.